Meet the fearsome revolutionary of Albion and his trusty adventuring companion, a poodle with one of those silly-looking floofy French cuts. In Fable III as in Fable II, your hero has a faithful canine companion as he (or she) foments revolution in industrial-era Albion. 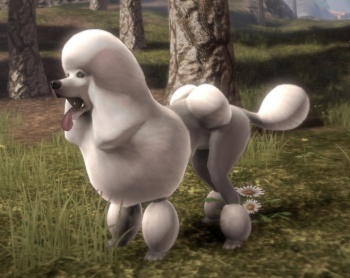 It seems that Lionhead has realized that gamers really like their four-legged friends - perhaps from the outcry over certain events in Fable II - and so will be releasing an entire mini-DLC pack all about doggies. The Dog Breed Pack, which releases today for 240 MS Points, will let players adventure with their choice of three different dog breeds: a Doberman pinscher, a German Shepard, and a poodle. One of those things doesn't seem like the others. Now, don't get me wrong, poodles are pretty badass. They're smart as hell, they're incredibly fierce in a fight (especially if their master is in danger), and they're very talented when trained. I'm not taking any umbrage with the fact that the poodle is there. Just ... why did they have to give it the French cut? Now nobody is going to take my fearsome battle-poodle seriously.